NSW Nationals Member for Dubbo Troy Grant has officially recognised more than 20 years of service from a local champion. 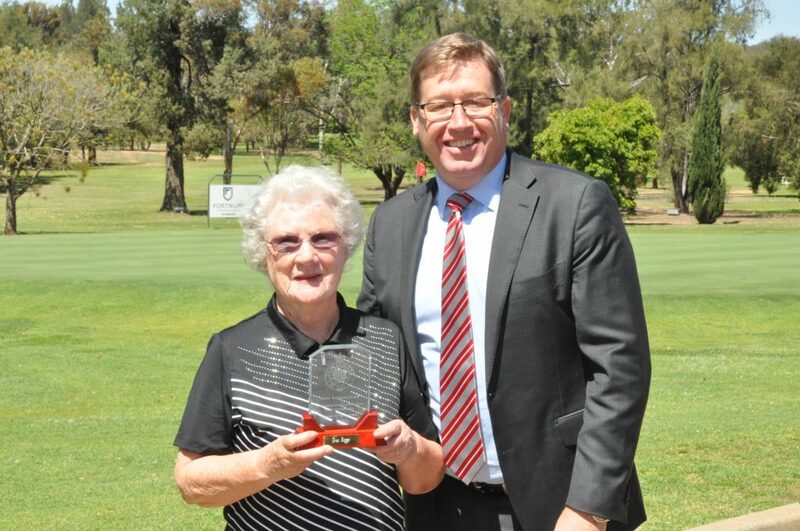 A large crowd of golfers was at Dubbo Golf Club on Monday when Mr Grant handed out an Electorate Award to Tina Beggs. The surprise occasion coincided with a royal-themed luncheon after the regular Monday morning ladies competition at Dubbo Golf Club. Mrs Beggs was nominated for the award by her peers at the club, where she works hard to coordinate competitions and recruit members. Mr Grant said the Electorate Award was a fitting honour for a wonderful lady. Mrs Beggs started her voluntary role at the club 22 years ago, after the death of her husband three years prior. “I lost my husband 25 years ago and if I didn’t have golf I probably wouldn’t be on this Earth,” she said. “I come out here and I encourage everyone, especially those that have lost loved ones or new players. A lot of them are too intimidated to come out here but I tell them we’re so laid back we’re almost lying down. We’ve got ex-golfers that have given it up for various reasons but I like to keep them involved. “I’ve got a saying ‘beware of the chair’ because you have to keep moving to keep your bones and muscles strong.